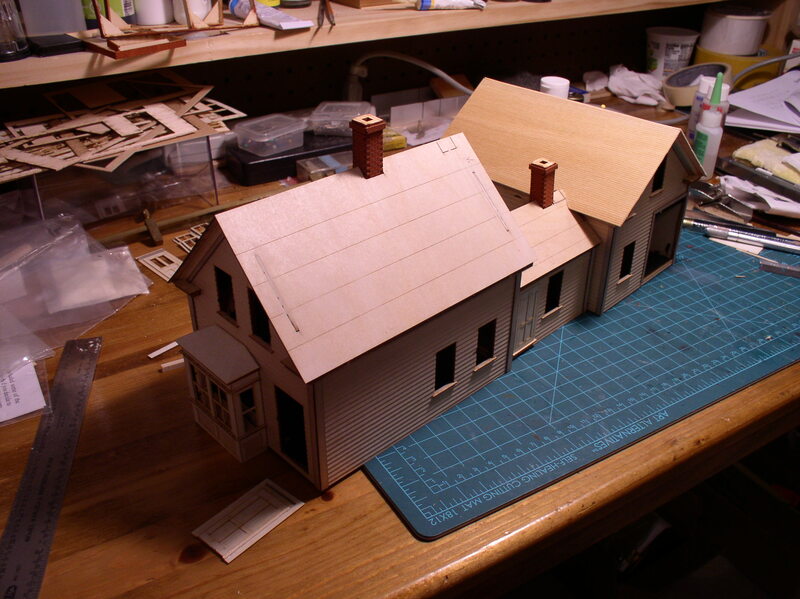 The house model has been coming along nicely and I am pleased with the construction so far. I have chosen the configuration for siting as shown below. Obviously missing yet are the roofing shingles. They are planned to be a dark green and are awaiting a warm enough day for the prep painting. The windows are waiting for their white coat. Then they will have the glazing installed and inside window treatments such as shades and curtains before final installation. The House on Route 214. The house that you saw in the last post has had its location selected. It will be located on Route 214 which is a local Maine road that passes through the middle of Ayers Junction. I have decided to build the three units of this connected house separately and join them later when I determine the best placement for the lot size that I have. Construction continues on the work bench. It is amazing to see the accuracy of this kit. I have the sense that the tolerance of these laser cut wood parts is around .010 inches. It is a type of tab and slot assembly. The tabs are the same size as the slots, therefore the fit is very tight. Rather than risk a split I have found that just a swipe or two across the tabs on both ends with a fingernail sanding stick is just enough to reduce the tab length for a perfect snug fit. This next photo shows some of the trim being added to the main house and also flat black being added to the interior walls. This house will not be lighted and so I am reducing the view if one looks through the windows. The low height parts with the gussets are the foundation pieces. The outside of these parts have etched brick features. 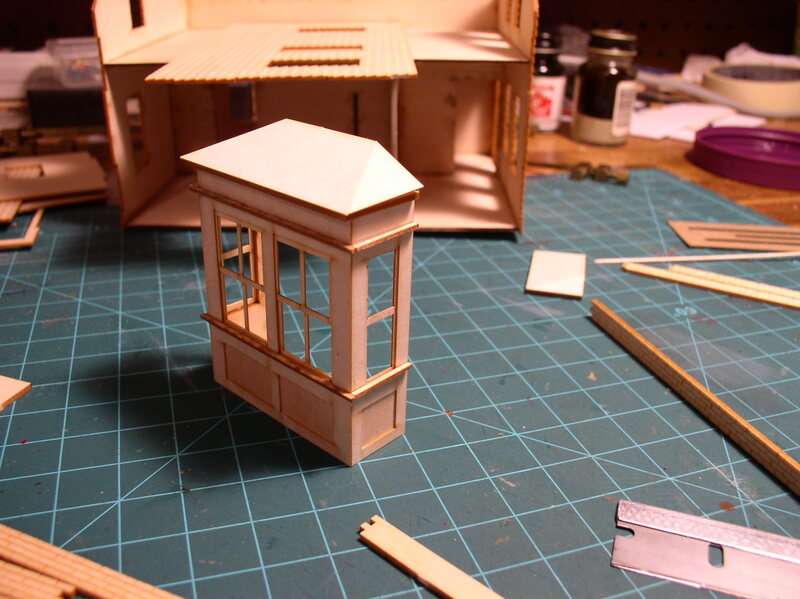 Also shown is the assembled bay window which fits over the large opening to the left of the front door. This is a larger view of the bay window. Here you can see how the detail is built up through various layers. I am testing the addition of ACC to the wood glue as the instructions suggested. However, I am satisfied that the Pink Flamingo glue is more than adequate for strength. There will be more as assembly progresses. A combination of a knee acting up and a predicted ice storm over the next day have changed my plans about getting back to the railroad for the next day or so. I decided to get out and look over a kit that I have had for a couple of years. 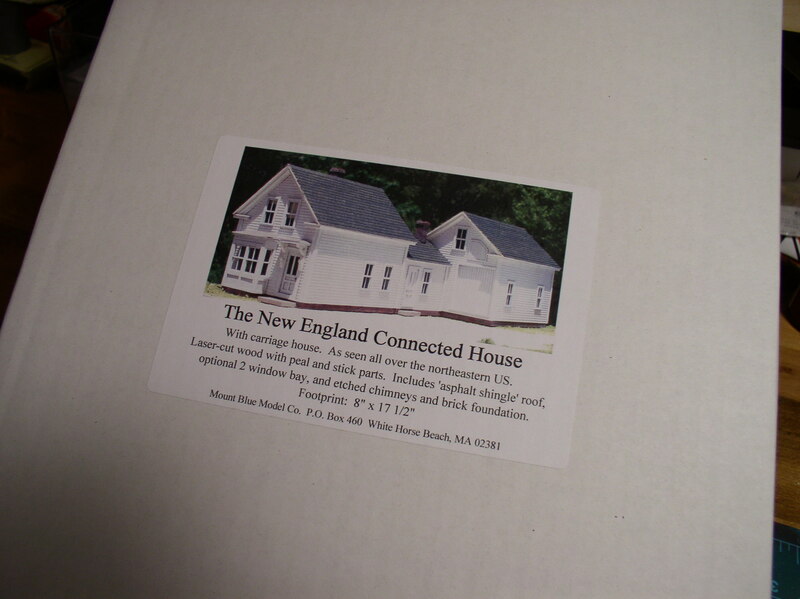 It is a kit for an authentic Maine house which is perfect for my needs. Actually I have two of these with the eventual plan to add one at Ayers Junction and the other in Eastport. The popularity of Bachmann ON30 has brought a large number of new narrow gauge followers to the hobby and along with it, some new manufacturers such as Mount Blue into the O Scale market place. If you check out the web site, you will see what I mean. 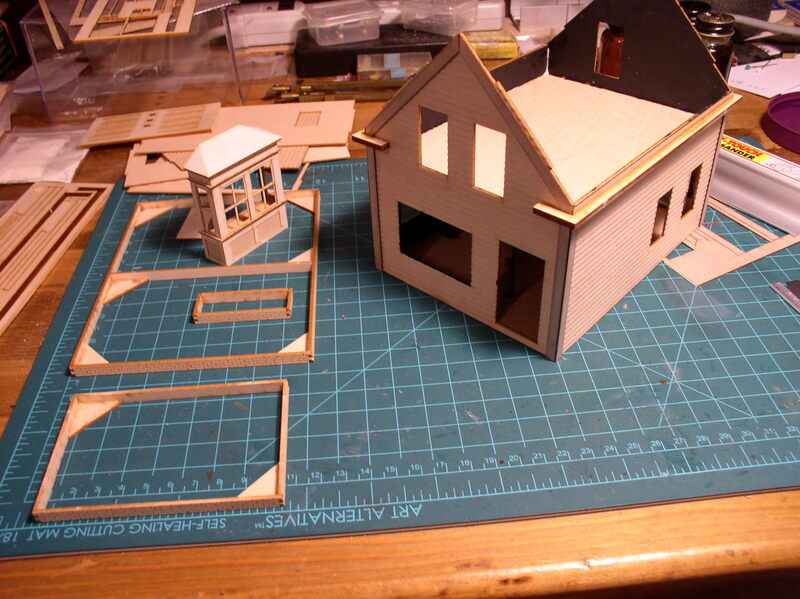 The houses are primarily laser cut basswood kits that are well engineered and quite complete. They will yield that ‘downeast’ Maine look that will help to establish the railroad’s sense of place when finally added in. I purchased the house style with the attached barn because it allows many different siting arrangements and even though I have two, they will look quite different in their final setting. 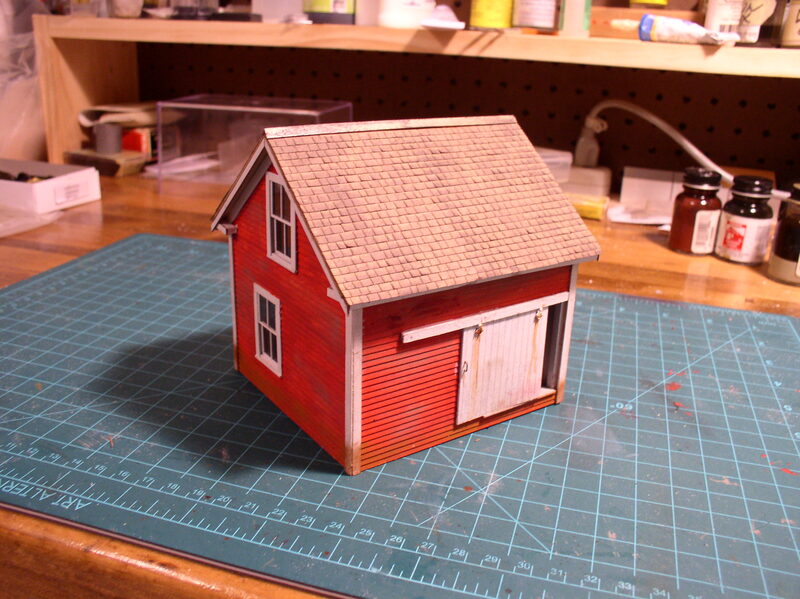 I have previously built one of their kits which was a narrow gauge section house that I turned into a small barn. It uses the same assembly techniques as the houses. This will be a nice change of pace from bodies that have wheels under them. I’m looking forward to it. 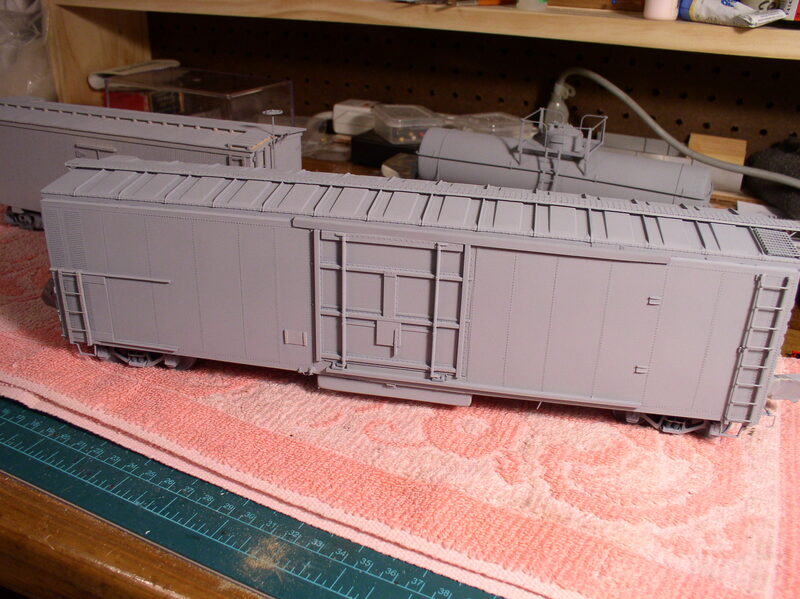 My last entry showed two of the three reefers I have been constructing. At the same time I have been squeezing in a bit of time on the 8-hatch model. This one has been pretty straightforward as a modification project, sometimes known as ‘kit-bashing’ which is a term I don’t care for. 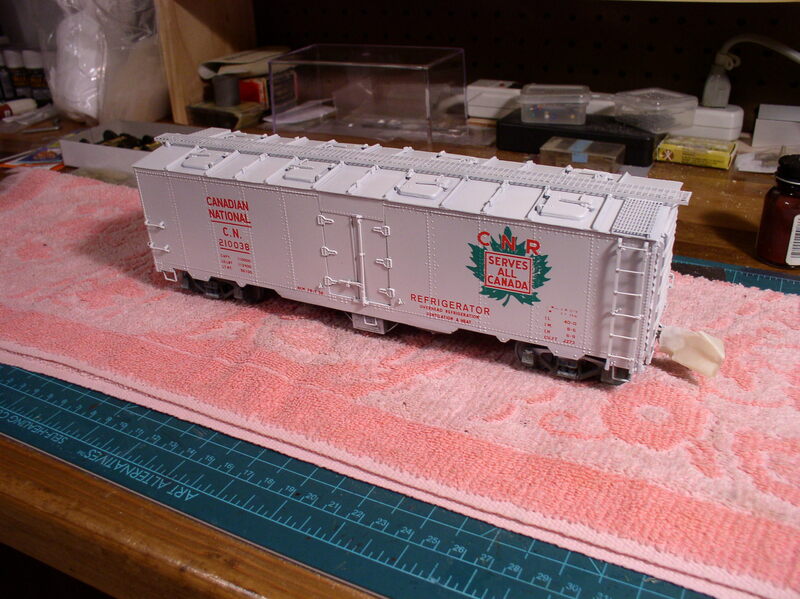 My model is modified from an Intermountain steel reefer. The underframe has been changed to accommodate the under floor charcoal heater. The sides have been modified to accept the shorter door which is required to clear the internal brine tanks that are hung from the roof. 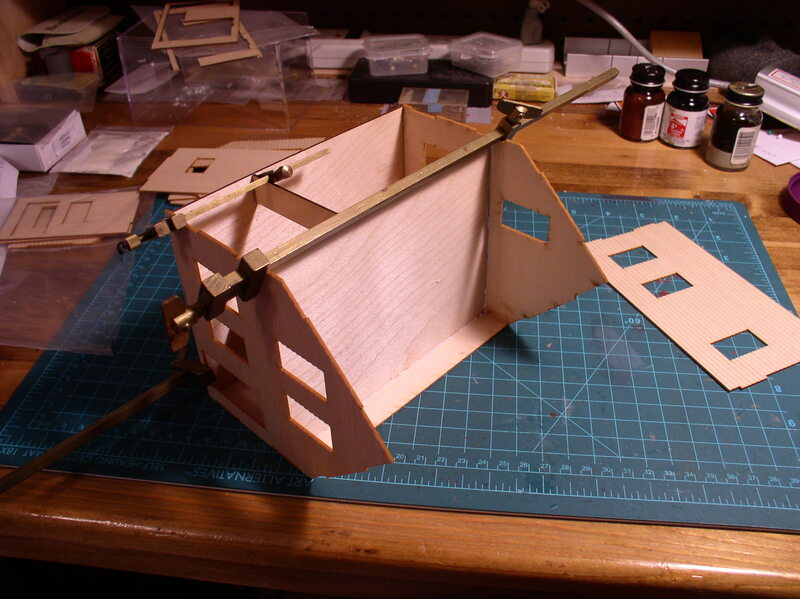 The roof itself has been fabricated from styrene using the hatch parts from the initial kit. Note that this car fits well into my favorite era, one with ladders and roof walks, and without graphiti. The lettering is dry transfers from CDS. The final finishing will include more flat clear coating and some weathering to represent a car that has been in service several years. This is a car that would have been used quite seldom in transporting fish from the Maritime provinces to Eastport via a very round about route. More about that later. 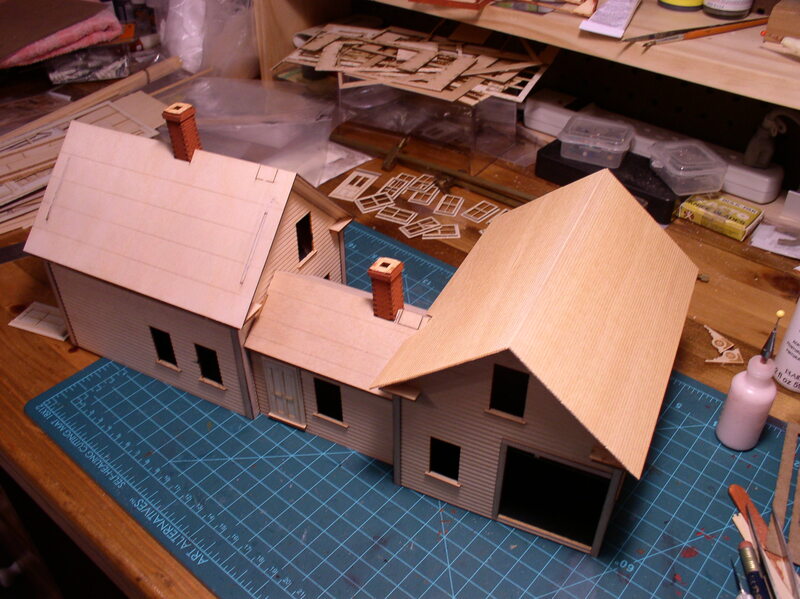 But in the meantime I have been able to make progress on the model front until I can get back to the railroad itself. I have also been working on the Scott Company Mobil Oil storage tanks that eventually will be added to the Eastport Yard. 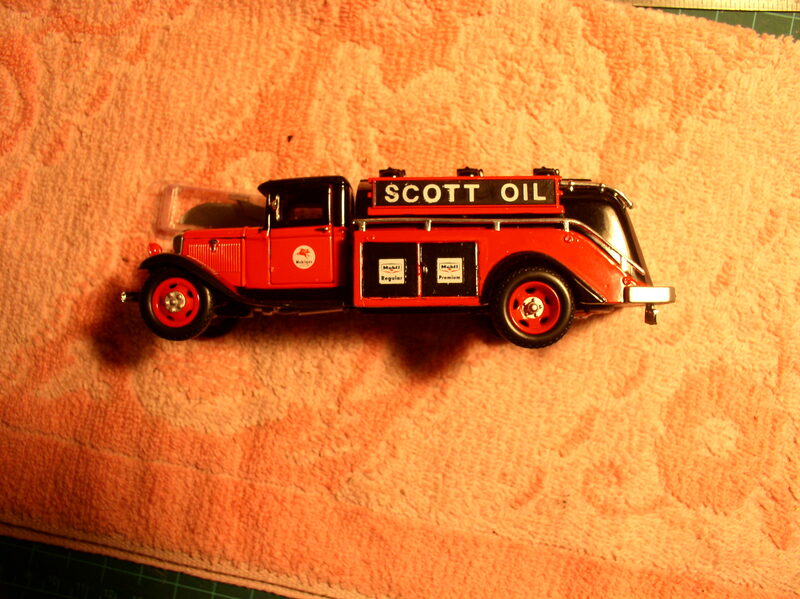 Along with those a truck will be needed to help fill out the Scott fleet. That’s the February effort so far. Additional railroad photos will be added soon. Several of you folks have asked about the reefer project. Well, today was a beautiful warm day that allowed the final primer coat to be applied. The wood meat reefer will probably need another coat. The siding is a bit fuzzy after this last shot, so I will have to address that. I also found some pre-mixed Floquil in a box which I prefer at this stage rather than start with a new paint system. The fifty foot mechanical reefer is now ready for its color coats. I think the panel rivets look good and are not out of proportion. Temporary trucks are shown under the car. Masking could turn out to be a challenge because the masking for the blue door will be right along the rivet line. I’ll need to use a low tack tape to avoid lifting the rivets. 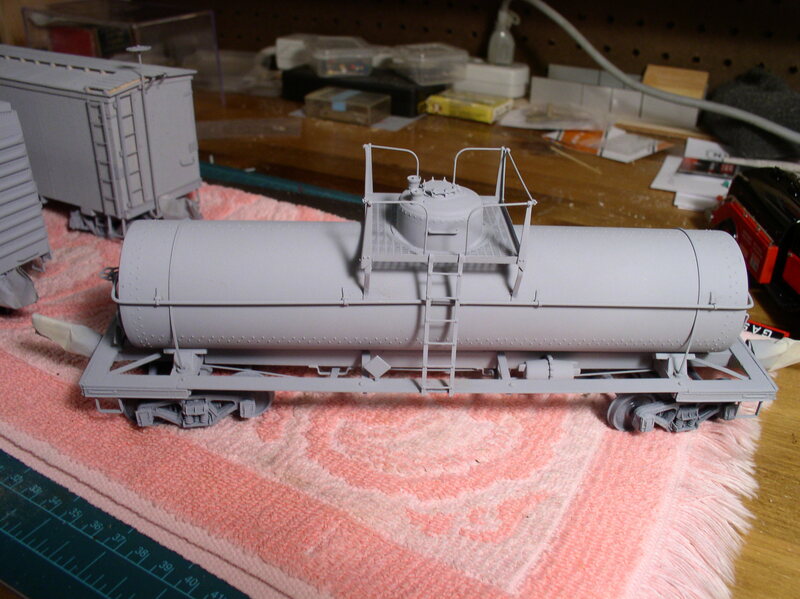 I also completed the priming of the tank car. This car is scheduled to be white with a black center band. In the Eastport scheme of things, the car will be usually found on a service track in Calais providing diesel fuel for the local switchers as well as the road engines that arrive with the daily freight from Bangor. These three cars will probably sit around for a while and let the primer harden up as I am anxious to get back to the railroad itself after being away for three weeks due to other family chores. There is a wood working shop being built adjacent to the railroad which requires some finishing attention, but my primary focus is to get back to the railroad itself. My friend Patrick recently posted some of his work at the O Scale Trains Blog on a road crossing. I found it very inspiring and it got my own juices flowing. I need three of them built for Ayers Junction. Maybe that’s a good place to start. All bench work is completed. Track work is about 50% done. This includes three of the four signature scenes; Calais, Ayers Junction, and the Pennamaquan trestle. Wiring for the finished track work is also complete. The DCC equipment is mounted on a shelf. The scenery landform is about 20% complete. Structures have been built for Calais and Ayers. Several have also been built for Eastport. One locomotive and about a dozen cars are now ready. 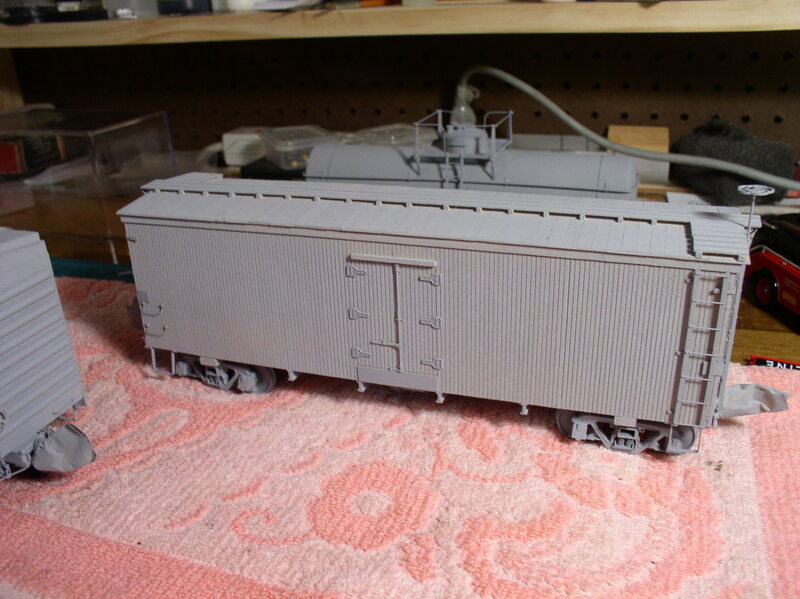 Three new reefers have been built and are awaiting painting. The backdrop has been completely installed. Additional support work has also been completed in the form of a basement shop and a model shop. All in all, I am quite pleased with the progress thus far. I have continued to do the required research for the branch itself and how it operated. 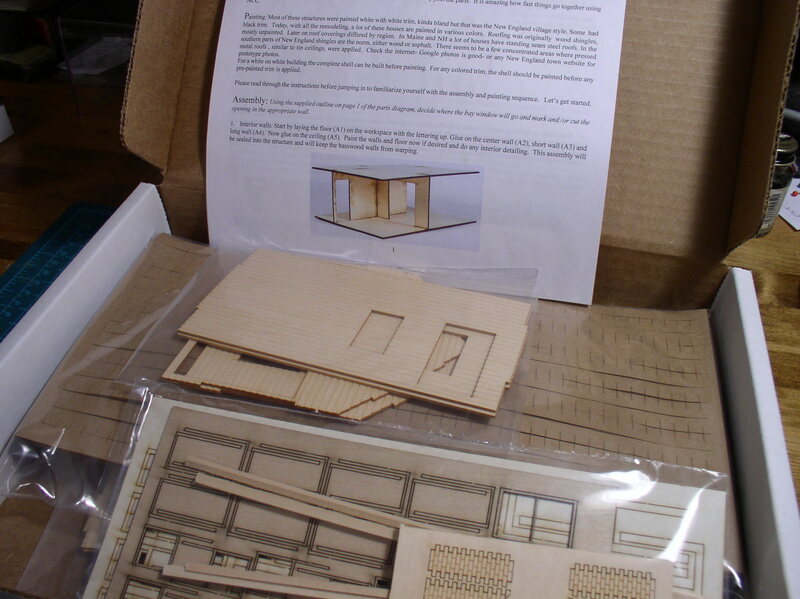 Because the project is 1:48, and the space is modest, many of the usual compromises are in effect. This has always been the case for me and I am not bothered by the results. Anything that will allow me to model in O Scale is appreciated. In prior modeling efforts I have used a freelance approach and the flexibility that provides. This time around I am modeling a strict prototype and really enjoying the challenge. I’ve learned some new methods of construction and modeling techniques. No photos for this posting except my own. 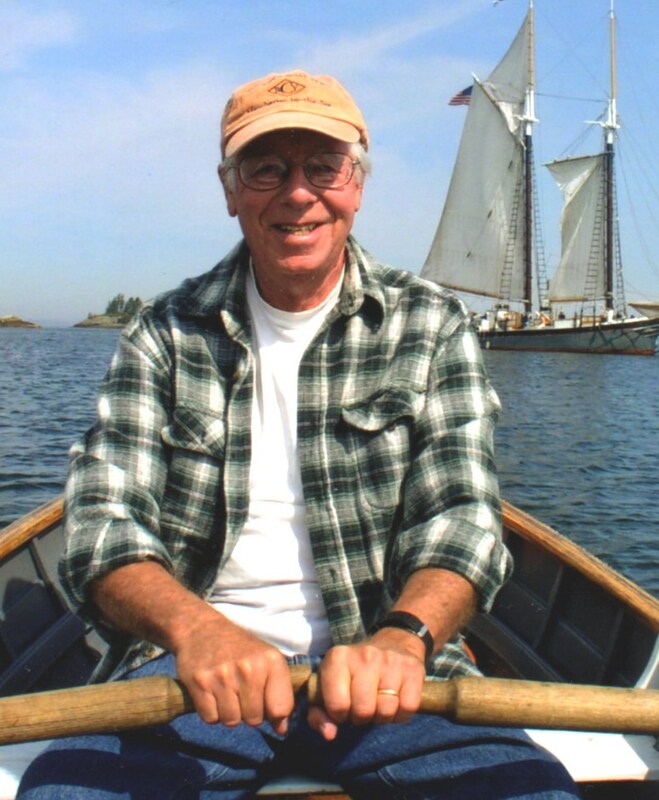 One of my other favorite pastimes is sailing off the Maine coast on the Lewis French. She is the schooner in the background. There will be more about her later and the role she played in the railroad’s history.